The sphagnum peat moss supply, which mainly comes out of eastern Canada, is down by 70 to 85 percent. For those of us who make our own potting soil, this is a serious challenge. My usual supplier yesterday delivered the news: "We've got no peat moss." "When will you get some?" Luckily, my backup supplier, Lowe's, had a small stack available for sale, and I loaded several 3-cubit-foot bales into my truck. Have I become a sphagnum peat moss hoarder? Not quite, though the thought did cross my mind. Why sphagnum is special: peat moss actually contains no organic nutrients of its own, but it's like a particularly valuable sponge for air, water, and the nutrients present in compost. Mixed in the right proportions with compost, perlite, dried blood, green sand, and rock phosphate, sphagnum peat moss serves like a timed release mechanism in potting soil. I've been using it for years and annually make 200+ gallons of potting mix. I'll be making twice that much this spring because we're lifting and potting up hundreds of garden perennials, shrubs, and tree seedlings for the big plant sale in June. Ironic as it sounds (since peat moss accumulates in wetlands), the present shortage is being blamed on too much rain in Quebec and New Brunswick, where most of the peat moss we use in the eastern United States comes from. 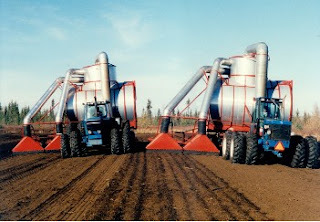 Here's a photograph of a couple of peat harvesters at work, though exactly how they work is a complete mystery to me.